Adafruit customer service forums • View topic - x0xb0x Project Status 2010 - please read! Adafruit is thrilled to be working with Willzyx Music, the x0xb0x is back. In our previous post & announcement we let everyone know that we would unable to support the project in the best way possible and we would be figuring out what we can do to help people get kits again. I just spent the last 10 years working in a San Francisco music shop and I really liked my job. I loved that I was helping people make music and that’s something that I still want to be a part of. Me and my wife have been making plans on moving to Taiwan for a number years and in 2009 we took the plunge. During 2009 I was selling completed x0xb0x’s on eBay under the name of bitcrusher76, it was a success and I am continuing on with the opening of my new web store willzyx.com. My goal with Willzyx Music is to keep supplying the x0xb0x community with Parts and Kits. I have spent the last year building up a stock pile of parts and will bring the Kits back at an affordable price. Any new projects that are produced from Willzyx will have the same MIT open source license, so you can hack, modify and commercialize any of Willzyx’s original designs. 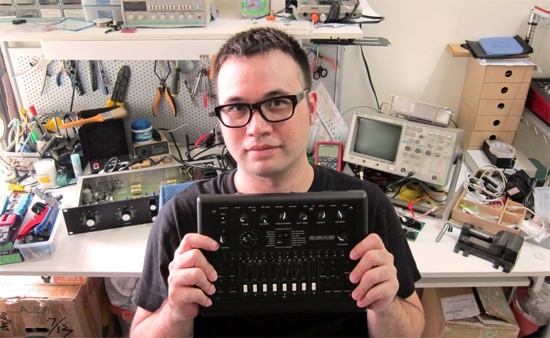 We want to thank James for being part of this with us and we’d like to thank all of customers, fans and everyone who has made the x0xb0x one of the best open source synth projects – LONG LIVE x0xb0X. The x0xb0x (Adafruit edition) was available as a kit that includes all parts necessary to build a x0xbox: PCB, case with CNC machined faceplate, components, buttons and knobs, AC adaptor, pre-programmed microcontroller, and (of course) poorly xeroxed assembly manual*...You supplied the sweat & tears. We have made 9 runs of 100 kits each. All but one of the components in the kit are through-hole.We had a great run and we are currently exploring how to best support this project in 2010 - so far we've made the project completely open source and we will have more updates in the month of April with what's next for our role with the x0xb0x. Because of demand and time/cost to make these kits -starting in 2005 we created a "waiting list" where interested kit makers could sign up to be notified if and when the next run was available for purchase.This list was a "spot in line" for the kits Adafruit Industries may make based on pricing, time and demand. We did not accept any payment in any form until the kit was shipped and the listee was notified to place their order with a special password for that run. This worked out great, we never "held" funds unless a kit was sent. The waiting list was simply a "back in stock" notifier for potential x0x customers. At this time (4/2010) the waiting list is closed and no longer will be used. Our data retention policy for this list is as follows -- We do not retain email addresses or names, if you signed up you can safely assume the list has been deleted, you will never be contacted by Adafruit or anyone else. We respect your privacy. We hate spam. We created a video of the tour of the empty waiting list, you're welcome to review it here http://www.adafruit.com/pt/x0xzero.m4v. If you have any questions please email support@adafruit.com - phil (me) will answer your questions if we didn't cover something here. We will have more updates soon in the next days and weeks, we wanted to post this up as we updated some of our pages and re-did our inventory. Re: x0xb0x Project Status 2010 - please read! I noticed the pcb's and pots etc have been taken down not for sale? I want to build another SS'er. I'm very happy with the one I already have. You guys are awesome. I *hope* you guys are just re-doing inventory, etc... - I was just about ready to order another PCB set (not to mention the good deals on some of the other parts)! I just acquired the rare silicon components, but didn't order the PCBs and case panels yet. Hey there ... I've managed to get all the bits, I just need to order a PCB and panels! I'm sure there's a fair number of people in the same situation, are there any plans to do a run of PCB/panels? I will keep bare PCB for the x0x , i/o and main board in the future. I have some spare at the moment but I need to do an inventory first before I sell them. Same situation here - also have rare silicon parts but looking for PCBs and panels. I too have sourced all the rare parts including original Roland chips etc and saved the money for the PCB's! Now, as I go to place my order there is no listing for it on Adafruit! Calamity! Please take this as another expression of interest, if you have any more I will be more than happy to buy! Can you PM if they become available? If not then thanks for an awesome project! If you guys that are after pcb's check the x0xsh0p section of the forum, then you'll find a couple of sources for them. There are alternative suppliers for panels too if you look. we didn't "claim" anything, this is what we've said specifically. we've made the project completely open source and we will have more updates in the month of April with what's next for our role with the x0xb0x. we're going to try to do what we think will get the most x0xb0xes to the most people, it's an open source project it can never go away. just to be clear the "waiting list" was an in-stock notification list, we decided this was the best way to do this from the start - we never took funds unless a x0x in-stock and notification email was sent with log/password and the customer placed the order. this worked out great for our run of about 1,000. later we put as much inventory as we could in stock and for years we sold PCBs, panels and more. I feel Adafruit has the right to do what they want. We can all be thank full that its Open Source. We can all still make/buy x0xb0x's due to this. I'm greatful for the resources you've provided. Thank You. Just out of curiosity, If you decide not to make more PCBs available is there a layout? JRock wrote: is there a layout?